Eosphoros hail from Portland, Oregon and formed in 2016. Although an otherwise-new entity, the band houses a wealth of experience in the thriving Pacific Northwest underground, including as they do ex-members of Shroud of the Heretic, Triumvir Foul, and Shrine of the Serpent. 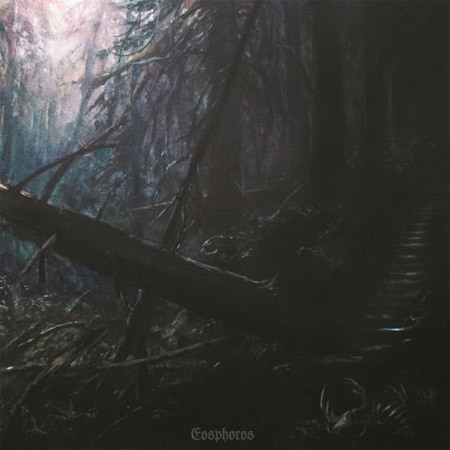 Whilst retaining suitably comparable levels of griminess of the aforementioned, as Eosphoros, the power-trio exude a surging 'n' spectral sort of mysticism, grounded in the ancient black metal of the 1990s (particularly in southern Europe) but wholly brimming with the esotericism that's brought the Pacific Northwest BM scene to international attention. Comprising six epic-length songs in a sinuous 46 minutes, Eosphoros is the epitome of album-length journey. With wanderlust as their only guide, Eosphoros dig deep and dredge forth a feral intensity that forever coils, like the mighty Ouroboros, whipping forth delirium and diabolism in equal measure. But, for however hysteric their attack may be, the band never sacrifice dynamics, offering just as much light as shade; not for nothing are they guided by the illuminating light of Lucifer. Those component tracks - "Promethean Fire," "Dross," "Trance of Annihilation," "Feral Heart," "Solitude," and "Sylvan Apotheosis" - are all as aptly titled as the next, evoking the same illumination, the same wanderlust unto delirium, that has guided Eosphoros from the beginning...only now, those fires burn brighter than ever. Eosphoros light a unique torch with their self-titled album: will you take that torch, or get burned? Feel the first flame with the new track "Feral Heart" below.